Roekkr finished his Canadian CD title on the weekend (with several extra legs to boot!) and also earned two legs towards his Rally Excellent title. He did this on his 4th birthday (and apparently there was birthday cake for the dogs too). Roekkr is now CH Blazingstar Longspur at Labrys Can CD JH WC RA Am CD WC RE. Congratulations to Roekkr, Linda and Joey! Happy Birthday to Roekkr and all of his littermates - Riley, Sam, Rosie, Toby, Maggio and Wally! 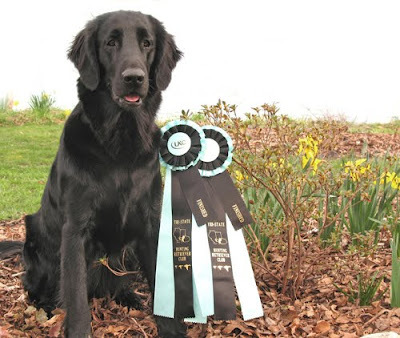 Last weekend Annie (HR Blazingstar Beaufort CDX SH) succesfully completed two legs of her HRCH title (Hunting Retriever Champion). She needs two more legs to finish it, but it is looking like she may have to wait until after she has taken care of motherly duties. Annie will be bred to Doc (CH Black Walnut Asclepius MH AX OAJ WCX HOF) very soon. While Brian was handling Annie in the field, Katy took Blizzie to an obedience trial. Blizzie (Songdog Blizzard Warning CD JH, a daughter of Blazingstar Snow Bunting) got her first two legs on her CDX title. She placed 2nd in both trials. Congratulations to Annie, Blizzie, Brian and Katy!! This short clip shows Ballyriver Mackenzie in the Post Graduate Dog class. He won the class and then went on to win Best of Breed and Group 4 in the Sporting Group. It was great to see him - he is a gorgeous dog with outstanding movement. 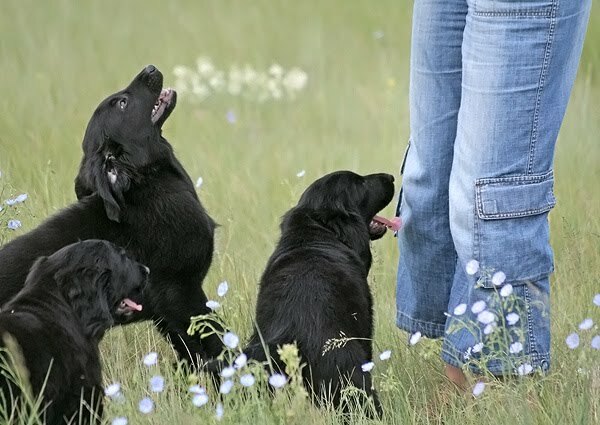 I just came back from 2 weeks in England, visiting family, friends and, of course, flat-coats. 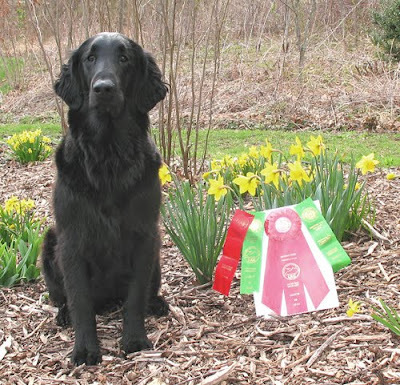 I spent several days in Derbyshire with Hayley (Rainesgift flat-coated retrievers) and also enjoyed a couple of days at Crufts. 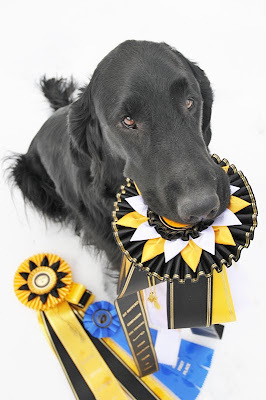 It will take me a while to sort out all of my videos and photos, but here is a short clip of Hayley and Remus (Rainesgift Over the Moon JW), who placed 2nd in the Graduate Dog Class. The first place dog is Braidwynn Bennigan (son of Rainesgift Seymour) and the third place dog is Brief Encounter at Darksquires. They are seen here getting their write-ups done by the judge. Maggio (Blazingstar Mountain Bluebird) had some success in the rally ring last weekend. His owner, Annette, writes "On Saturday Maggio took High in Trial, and High in Class at the APDT Rally trial in Calgary with a 209 score :-) towards his Advanced title. Couldn't be happier!!!!" PS - we LOVE the photo!